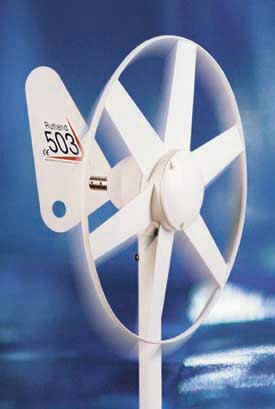 The turbine has an AC 3 phase output from a PM alternator, this is the most efficient design for maximum output. The output from the turbine will need to be rectified to DC using a standard 3 phase bridge rectifier. If you wish to install a charge controller this will connect across one of the batteries and monitor its voltage, when it gets to 13.8 it will switch the output from the turbine to a dummy load, when the battery drops to 12v it switches back to charge mode. 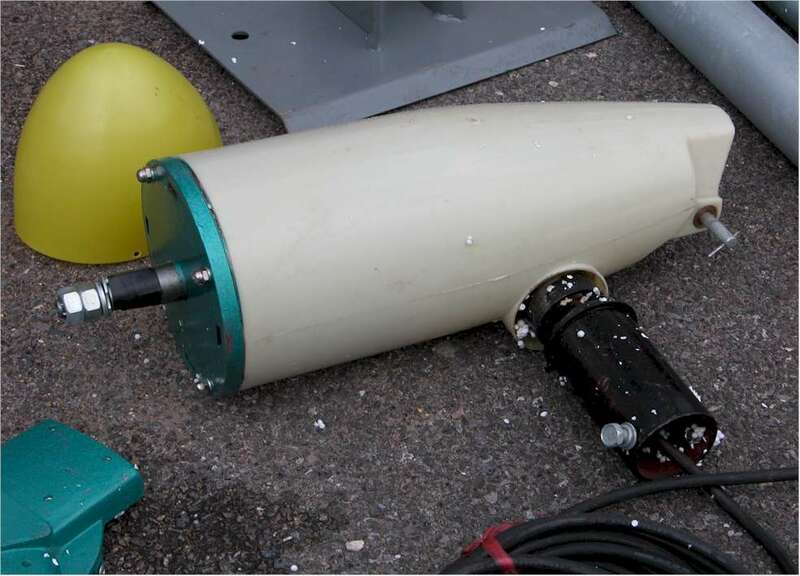 A dummy load can be a heating element, water heater, lighting etc. Without a load the turbine could run too quickly. If you are using a battery bank you could run 3 separate 12v 'rails' to supply an 12v equipment. 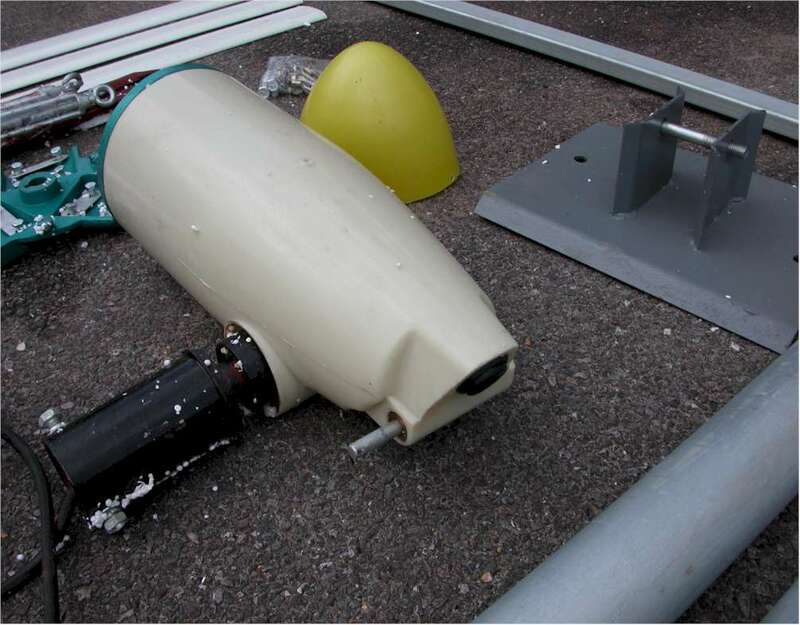 The turbine body measures 50x22cm and weighs approx 25kgs, it has slip rings for the output and will turn out of the wind in extreme conditions. 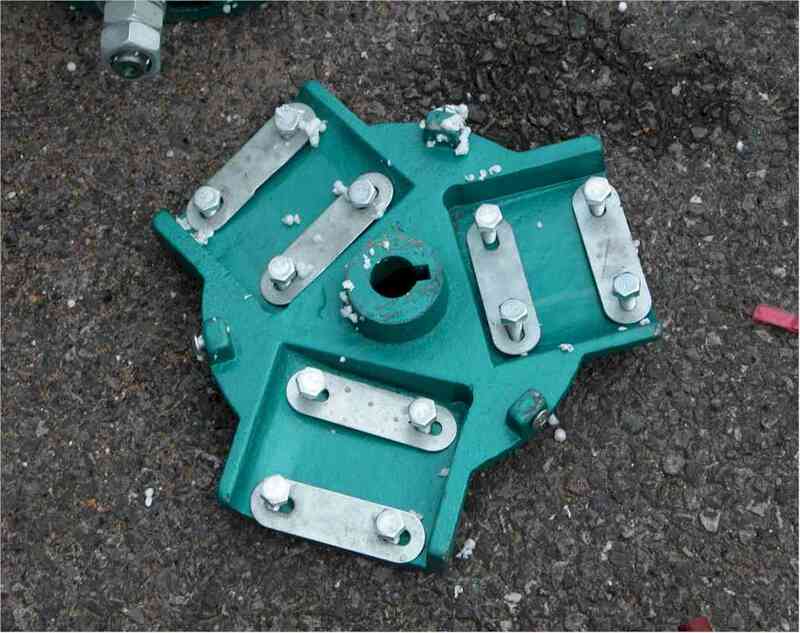 The mast and tail shaft are galvanized steel, the body is fibreglass. you can either assemble the tower with the turbine in place and winch it up or assemble the tower and then add the turbine using a scaffold tower. Turbines do make a noise, they are not completely silent! Finally shipping, if you wish to collect that's fine, just call us otherwise shipping is AT COST. The Rutland 913 is designed for marine use on board coastal and ocean going yachts usually over 10m in length. This unit will generate enough power to serve both domestic and engine batteries on board and the RWS200 Controller is available for dual battery charging. The Rutland 913 is a popular sight in marinas, thousands are in use worldwide, boat owners like it's clean, aerodynamic lines and its quiet and continuous operation. Without doubt this latest marine model accumulates more energy than any other comparable windcharger available, you'll always see a Rutland spinning in the lightest of breezes! 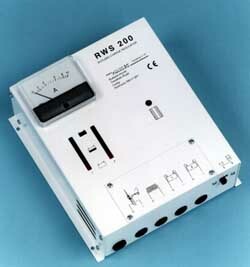 RWS200 Controller - Incorporates the SR200 Regulator, charge ammeter, dual battery voltage LED's, two battery connection terminals and switch for charging one or two battery banks simultaneously, solar panel input (maximum 50w when used in combination with FM910-3 windcharger). Housed in attractive white case with simple to follow graphics for installation. 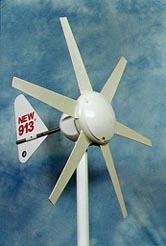 A completely unique mini windcharger designed with the weekend yachtsman in mind. The Rutland 503 is ideal for trickle charging batteries on board vessels less that 10m in length with battery banks of up to 100Ah. This latest model follows the success of its predecessor the Rutland 500 with a number of enhancements including performance and styling. Compact turning radius of just 225mm, great for when space is at a premium Latest design improvements - the Rutland 503 is more reliable and efficient than ever! The FM1803 is another product technological advancement engineered by Marlec. 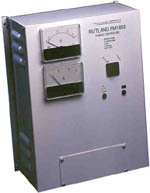 It follows the great success achieved with the original Rutland Furlmatic FM1800 which has established a proven track record of reliability in a variety of applications from the cold, harsh environment of Antarctica to the hot, dusty climate of the Sahara Desert. 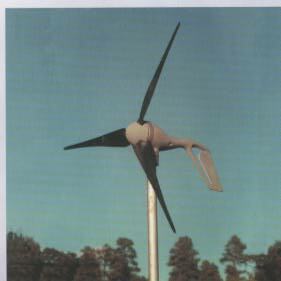 The Furlmatic 1803 is Marlec's largest power unit incorporating a "furling" tail system designed to orient the turbine at 90degrees to the prevailing wind in wind speeds above 35mph (15m/s). This allows the turbine to slow down, continuing to produce power whilst reducing wear on the unit. Use on land based applications where windspeeds are frequently high and sustained over long periods. Below you will see the performance specification and the dimensions of the Rutland 913. It's new aerodynamic proportions are designed to deliver maximum efficiency from its 1.8m diameter 2-bladed turbine. We've given the FM1803 a new aerodynamic styling and the latest generator technology to deliver nearly 40% more power without increasing the turbine size. In fact we've reduced the weight but the FM1803 is still as robust and "heavy duty" as its predecessor. Suitable applications include off-grid homes, telemetry stations, telecom sites, radio/tv transmitter stations, rural clinics for refrigeration and lighting, meteorological stations, security systems, navigation aids, portable power for expeditions and military field applications, etc. Whatever the application you'll find using the FM1803 is convenient, reliable and cost effective. It can be used alone or in conjunction with solar panels and/or a diesel generating set to create your own stand-alone power system free of costly grid installation and on-going costs. Cable - Three core cable is required between the wind generator and controller, the thickness of this cable depends on the length and more details are given in the Installation Manual. Distances up to 50m should use 1.5mm² cable. Mounting Pole / Tower - a minimum height of 6m of 81mm inside diameter tube supported by a minimum of 4 guy wires is necessary. Further details are given in the Installation Manual. That's because to date there are no firm international standards for how small wind turbines are "rated." 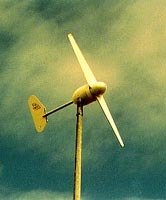 Most grid connect wind turbines are given a power specification at 10m/s (meters per second), the equivalent of 22mph or 19Knots. They do of course produce more power in stronger wind speeds. Bull chooses to rate our wind turbines at this same standard of 10m/s as we believe that as the industry matures a reasonable level such as this one will be established. Manufacturers rating points vary and consequently it is necessary to compare output graphs across a wide band of windspeeds rather than accept individual rating figures for wind turbines. So how much power will a windcharger deliver? The real measure of performance of wind turbines is "accumulated ampere hours" into a battery over a given period of time although this is a difficult measure for manufacturers to express since the users site for the windcharger will affect overall performance. Output graphs are usually an indication of instantaneous peak power at given wind speeds but in real conditions the wind is rarely constant, usually gusting up to 3 or 4 times the average. Wind turbines can theoretically deliver 4 times the power in twice a given wind speed so calculating total power generated using average wind speeds is misleading. the Rutland 913 delivers 1.5A @ 10knots, then we could estimate a daily yield of 24hrs x 1.5A = 36Ampere hours. However at the extreme the wind may blow at 20 Knots for 12 hours and be calm for 12hours, showing 10Knots as the average so the potential power generated can be quite different, ie at 20 knots the Rutland 913 delivers 7A, therefore 12hrs x 7A = 84 Ampere hours. The actual accumulated ampere hours in reality is somewhere in the middle demonstrating that average figures can be misleading. This also reinforces the benefit of wind generators that run freely in low winds maximising the available power of the more regular gentle breezes as well as the peaky gusts. The wind never blows constantly from one direction or at a steady wind speed, it blows in gusts. 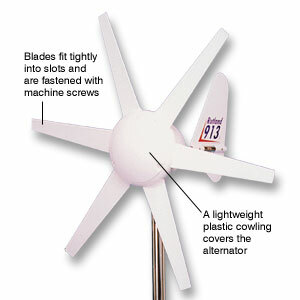 Most micro wind turbines are fitted with a free yawing mechanism and tail fin to direct the turbine into the wind. Where they differ is in the type of generator and aerofoil blades used which greatly affect their ability to adapt to the changing wind conditions. An unrivalled feature of all the Rutland designs is low wind speed performance. Our high inertia generators maintain momentum and speed between gusts of wind, continuing to generate power where more conventional designs slow down losing power and requiring a strong gust of wind to restart them. This means that overall a Rutland will generate more power into a battery bank in a day when compared to an equally sized or rated turbine and even in cases of generators of a higher "rated" capacity and turbine diameter! See the independent tests on our news pages and compare the turbine diameters to see that you don't always need a larger unit to generate the same or more power. 380 watts of electricity from our air module! 12vdc output, 300 watts at 28mph, 380 at 35mph, 100 at 20mph. 1.14 metre diameter (45") blade, min start up speed 7mph. Maintenance-free performance, easy installation and high output make AIR ideal for all applications. 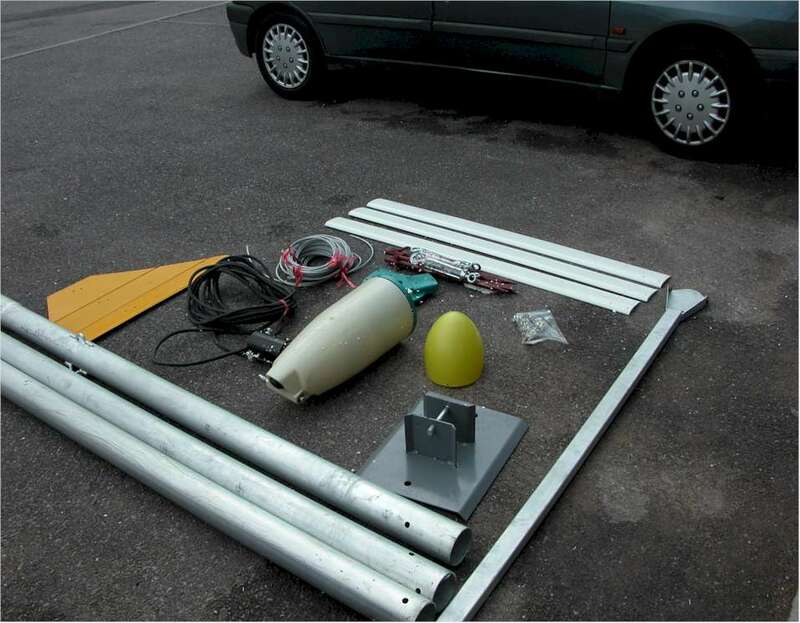 BUILD YOUR OWN WIND FARM FROM SCRAP! area of energy production it will make interesting reading.